My boyfriend and I’s latest obsession has been scoping out different breakfast joints to have our most important meals of the day. His favourite has been pubs…. such as Brew Street Craft and Kitchen. This is a place where he can have bacon, sausages, eggs, hash browns and toast all for just $5. Yes you heard it. $5. I on the other hand, love pubs because where else can I have sangrias and mimosas at 10am in the morning?? Then of course there’s White Spot which is a 5 minute walk from home. They have a HUGE selection of breakfast items that I can’t wait to fill my stomach with! They are also known for their famous smashed potatoes. We were out for brunch a couple of weeks ago when I started thinking to myself ‘I MUST MAKE THESE AT HOME’. And of course, when I put my mind to something…I will stop at no lengths to achieve it. I bought a huge bag of the dynamic duo nugget potatoes from the Little Potato Company at Costco. I LOVE LOVE LOVE these potatoes! They are perfect for just about anything! I make mashed potatoes, roasted potatoes and I even use them when making my curry dishes. Who doesn’t love a slice of warm delicious apple pie? 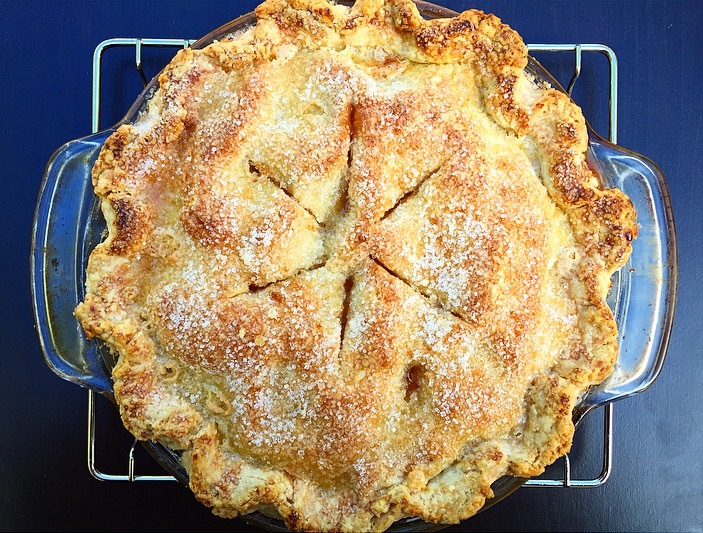 Apple pie has been one of my biggest weaknesses since I’ve been a child 🙂 When I was younger I remember eagerly waiting impatiently while my aunt and grandma whipped up their version of a classic Apple pie. I loved how rich and flavourful it was! Sure enough, when I turned 14 I started making apple pie on my own. The ingredients back then mostly consisted of basic pie dough, CRISCO (so good yet so bad! ), apples and sugar. As I grew, I discovered new ingredients to use and found which ingredients to toss. Of course (like everyone), I had my ups and downs. I once used dull apples that weren’t at all crisp and the pie was literally filled with liquid as everyone went to take a slice. I’ve also accidentally used too much shortening and the pie literally tasted like lard! But all in all, we learn from our mistakes. I would then watch 2 episodes of Anna Olsen’s Sugar from 7am to 8am. This was where I learned all about different baking techniques and steps on how to corporate ingredients together. By 8am, Rachel Ray’s 30 minute meals would be on and I’d be excited as ever! I was always amazed at how many items she could pick up before she got to the counter to cook! My mom and I have always been huge fans of her. When Target was closing down, we literally picked up each item from her cookware, bakeware and dinnerware collection for me when I move out 🙂 But anyways enough about that and let’s get talking about this amazing recipe! Always use crisp apples for the filling. I once used up some not so crisp ones and they made the filling so watery and not flavourful. 1) In a food processor, combine flour, salt and sugar and combine. Add the butter and pulse until the butter is pea sizes. 2) Sprinkle with 1 tsp of cold water and pulse until dough is crumbly but holds together. Add more water as needed. 3) Transfer dough onto a piece of plastic wrap and refrigerate until filling is complete. 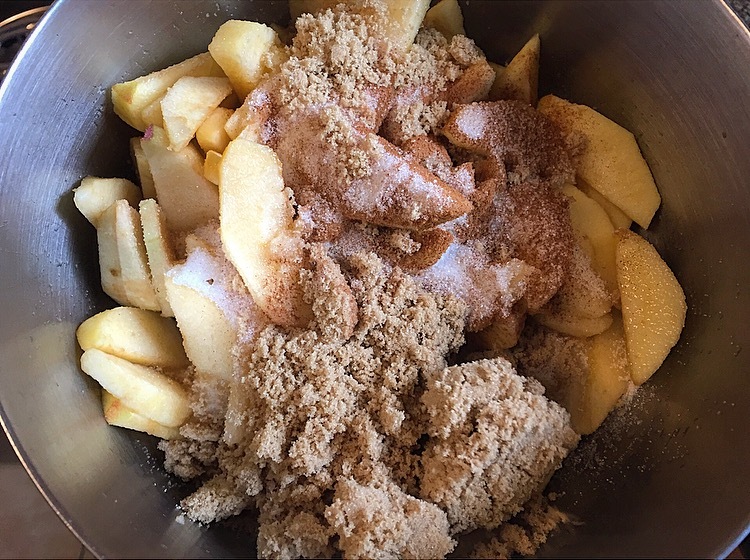 1) In a large bowl, combine apples, sugars, cinnamon, salt, flour and lemon juice. 3) Lightly flour a large surface and place half of the dough in the center. Roll from the center outward to form a 12 inch circle. Transfer dough onto a 9 inch pie plate. Repeat with the second half of the dough but do not transfer onto the pie plate at this time. 4) Fill the pie plate with the filling. Remember to pack the apples slightly higher in the center. Add the cubed butter to the top of the filling.